I have a new work friend who happens to be a girl with a tiny head. We were talking all things lids and she confessed a similar almost identical experience to my own when dealing with a specific shop which shall remain nameless but resides in the hustle & bustle of the Melbourne CBD, and happens to have one of the largest motorcycle parts and bikes warehouse in Australia.You know who I'm talking about. For me it was just repetition - I know what I am going to get when I shop there. I've been there and shopped there for over 10 years as a Melbourne biker, and nothing changes except the faces. On my latest trip I was destined for a new Bell Moto-3 after seeing and reading this most excellent piece on Biker Exif. Looks cool I thought, wonder what head shape it is? What what the liner is like? Is it available now? How about that trick colour scheme, is that in stock too? Simple questions running through my excitable mind when it comes to shopping for anything motorcycle related. I go up the stairs and immediately spot the helmet in various sizes and almost squeal with glee as I see the colour I want on the shelf. I go through the motions of inspecting availability and different sizes when I notice the livery I like has a leather inner, compared to the block colours which have a more traditional soft velour kind of inner. 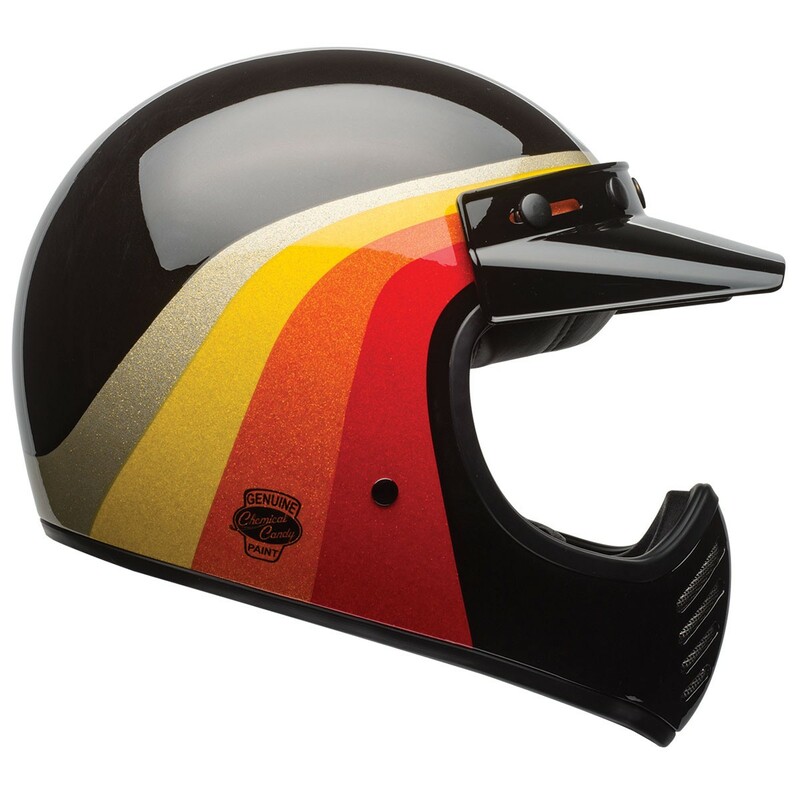 Interesting I thought out loud, more drag racer helmet than road warrior but hey, who am I? I remove my glasses and start out trying on the XL and L variants with and without said leather vs plush inner, noting straight away the huge pressure point differences between X and XL. Let's back up a bit first of all. Helmets are broken down into fairly straight forward categories. Open Face. Full Face. Dual Sport. Dirt Bike. They can get a bit askew with flip top lids and Adventure styles that kind of split the difference between Dual Sport and Dirt Bike, however that's a pretty simple breakdown if you are new to this. They can also fairly simply be measured to fit your head. A good shop will have a tape measure and someone who knows how to use one. Maybe. It's a simple tool with a tape measure around the outside edges and an expanding/contracting mechanism to fit snugly over your head. 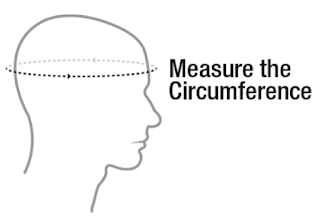 They say you should measure your head from just above your eyebrows to the back of your head, with the line fitting snuggly above your ears to get the best measurement. In other words, your head's circumference at its largest point. There are also children's sizes but I am child free and mostly speak with adults so I ain't going there in this instance. Homo sapiens also tend to have two distinctly different shaped heads - round and oval. It is also largely known in the motorcycle community that there are predominantly two distinct different manufacturers that cater specifically for those two shaped heads. It's that simple. Most other makers either make one or the other (with exceptions). Now before you go barking mad at me, I realise this is a generalisation but over many years of motorcycling this is what I have come to find as gospel. Good manufacturers make lots of different padding inserts to fit you more or less snug, but I have never taken advantage of that, and even better ones actually take different shells and accommodate different sizes that way. So, how do you know what shaped head you have? Sit down and ask someone to look down at your head from the top, a birds eye view if you will, and check it with their peepers. Take a photo with your smartphone if you can't get anyone to help you. You will find it's pretty easy to spot the difference between and Egg and a Ball. I'm an Egg head and I measure firmly 60.5 which puts me painfully right in the middle of X and XL. I've definitely got a bulging, bulbous forehead (and bulgey eyeballs but that's hardly relevant). Armed with your new information and your head size and therefore helmet size knowledge you can comfortably approach your helmet shopping armed, and ready to refute ridiculous marketing speak from annoying sales folk. I always give em the benefit of the doubt first off and check their knowledge based on what I KNOW to be TRUTH. But if you stagger into any motorcycle shop without any prior knowledge of your head size and shape, you are prone to their sales spiel. It can vary from wildly optimistic to complete nonsense in a span of 1-2 minutes. As was my recent experience in the city. Me: "What shape would you say this Bell is?" Sales guy: "Probably more round like an Arai"
Me: *befuddled* "Round like a Shoei you mean?" Sales guy: "No definitely more round, like the Arai"
Me: "Um, I've found it to be the other way round, Arais' are more an oval shape and the Shoei definitely more rounded"
Sales guy: "Try this one" - shoves XL Bell in my hands. I take the helmet, pull back the flaps and slip it on my head and do up the cinche strap. Sales guy tells me to grab the chin and pull it up, then push it down. He pronounces, "nope. Try the L". I repeat the process as does he before announcing defiantly, "nope, I can't sell you a helmet, it doesn't fit." The end. He was nice enough about it, but as blunt as a texta. I think I just did that homer disappearing into the bushes thing or possibly slipped into a coma in defeat. I walked out questioning myself and wondering if I actuallly know anything at all, or if I have been mislead into a whole lot of codswallop for my entire life as a motorcyclist. Perhaps knowledge isn't power, perhaps knowledge is actually disability? Perhaps sales peoplre are just asshats who like to disrupt your own belief in yourself in order to get a sale. I actually think that was this guy's MO, make it seem you can't be sold the item you want, so you want it harder. I just wanted to have an intelligent conversation about a helmet that I like the look of. More fool me. When you're in the market for a new lid, go prepared. First up, get someone to help you measure your head and look at your basic head shape. Then get it measured using a measuring tape out of your mum's sewing kit. Then do a bit of research on the brands you like. Revzilla have great thorough reviews on most lids, and even I have done a coupel of reviews that I hope are helpful over the years. Know this, dark helmets attract heat, light colours (white in particular) reflect heat so consider your environment and when you are most going to be wearing your new lid. Have a budget in mind and try to get the best brand you can for the money you can spare. That's it. Head into your local dealer and take em on, head first, if you get me.